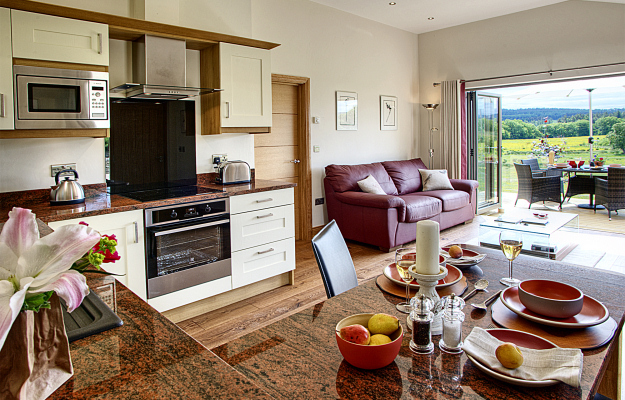 To enable you to see the layout of Woodside Lodge, a floor plan is provided in our information section. 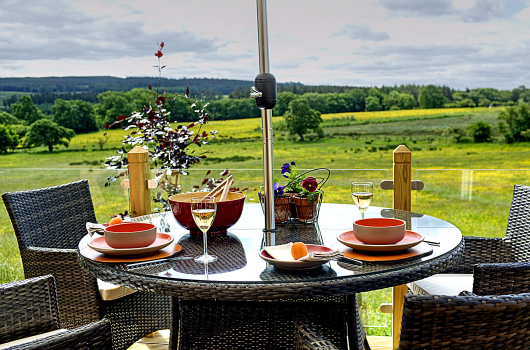 Nestled in the gardens of an 18th century cottage five miles south of the market town of Hexham, Northumberland, Woodside Lodge is a luxury self-catering holiday cottage retreat for two guests. 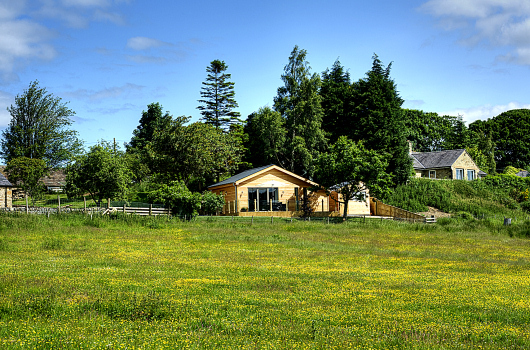 It offers ideal holiday cottage accommodation for a couple wishing to visit Northumberland. It is within easy reach of all of Northumberland's historic highlights, including Hadrian's Wall, Northumberland National Park and Northumberland Heritage Coast, as well as the urban attractions of Gateshead and Newcastle-upon-Tyne. Believed to have started life in the 1940s as part of a temporary local army camp, the lodge was moved to its current site and used as a workshop for the restoration of vintage cars and motor cycles. 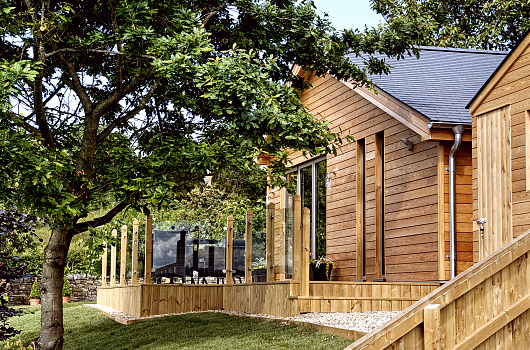 Then, in 2013, it underwent a radical transformation into a luxury self-catering holiday cottage; the original structure is still in place beneath 21st century insulation, recycled rubber roof tiles and sustainably sourced larch cladding. The front door leads into the main living space. 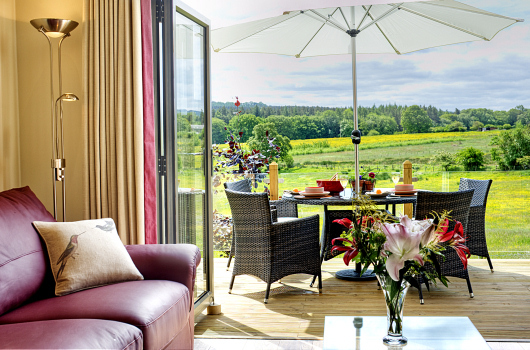 A light and airy sitting area with a leather sofa and wide, bi-fold doors affords superb views over pastureland and the Quaker Hollow wetland towards moorland and Slaley Forest. Free Wi-Fi, a flat-screen television with Free-Sat, a contemporary fireplace, a DVD player and an iPod dock ensure that you have everything you need for a relaxing holiday. The kitchen / diner is fully equipped with granite worktops, induction hob, electric oven, fridge-freezer, microwave, dishwasher, washer-dryer, and a comprehensive range of kitchen utensils. 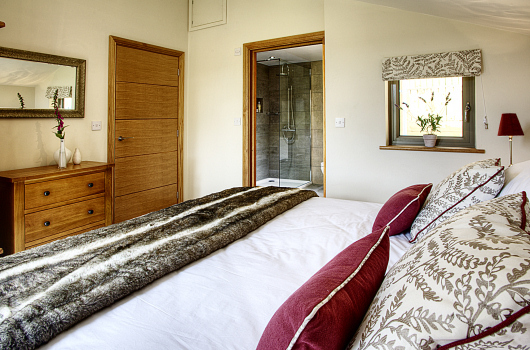 The bedroom, also with views over the fields, is stylishly furnished with a super-king size bed (that can be made up as two singles on request), an oak wardrobe and side tables. 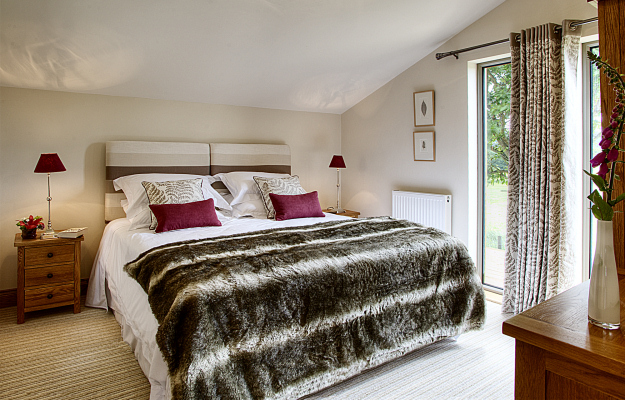 Non-allergenic duvets and pillows and White Company pure cotton bed linen add to the experience. 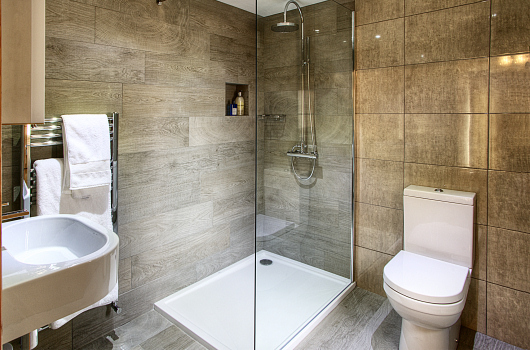 Adjoining the bedroom is an en-suite fully-tiled shower room with a large walk-in shower, wash basin and wc, complemented by White Company towels and Tisserand Aromatherapy toiletries. 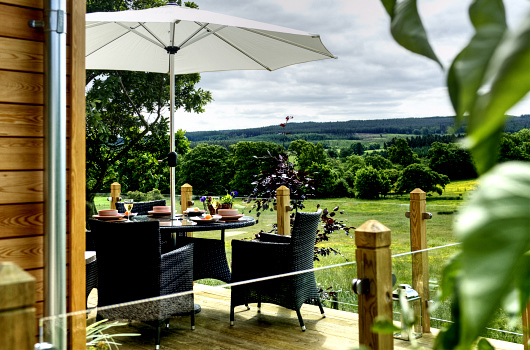 Outside, there is a large decked terrace, furnished with a dining table and chairs, parasol, barbeque and planters. 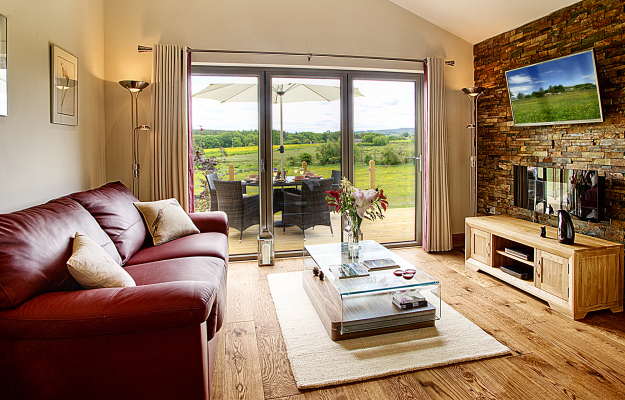 You can relax here and enjoy tranquil views over farmland. The birdlife is especially interesting; in spring, watch the curlews and lapwings gathering on the meadow, while, in summer, swallows swoop and dive over the grass and buzzards soar lazily over the woodland. This is part of a working farm, so you may also see livestock (cattle or sheep). A separate lockable dry storage area is available for bulky items such as walking gear, bicycles, etc.